Everybody knew Hampden Academy’s stranglehold on the Kennebec Valley Athletic Conference Class A would end eventually. After winning four straight regional crowns from 2012 through 2015, the Broncos were knocked out of the regional semifinals by Oceanside last season. This season, the team to usurp Hampden from the top spot in the league’s annual preseason coaches poll is Messalonskee. The Eagles will build starting with a strong backcourt led by seniors Nate Violette and James Kouletsis. Violette was an all-conference player last season averaging 15 points per game. McLaughlin said he thinks Violette could become a bigger scoring threat this season. Griffin Tuttle, a 6-foot-5 senior, looks to lead Messalonskee’s low post game. “Griffin can be an impact player for us,” McLaughlin said. Last season, Skowhegan reached the regional quarterfinals for the first time since 2010. The Indians lost 1,000-point scorer Isaac Witham to graduation, but return several key players, including junior wing Cam Barnes, senior forward Garrett McSweeney and senior point guard Brendan Curran. “Curran, he’s our leader. He’s the guy who organizes our offense and gets after it,” coach Tom Nadeau said. Nadeau doesn’t see one player replacing the offense Witham provided. “We’ve got a handful of guys who lead the team in scoring any given night,” Nadeau said. Gardiner has high hopes of being in the A North mix. The Tigers lost a trio of top players in Jordan Lamb, Brian Dunn and Eli Fish, but coach Jason Cassidy prepared for those departures by giving his underclassmen plenty of minutes during the season. He’s reaping the benefits, as Gardiner is younger but deeper and ready for an improvement on last year’s 8-12 mark. The team returns its point guard in junior Isaiah Magee, whom Cassidy said is a threat whether he’s looking to score or not. He’ll have options, particularly Eli Kropp and Hunter Chasse outside and 6-foot-3 Connor McGuire and 6-2 Ben Shaw inside. Last season, Lawrence was one of the most experienced teams in the KVAC. This season, not so much. The Bulldogs graduated four starters, but return 6-2 guard Mason Cooper, one of the top players in the league. Seniors Ryan Pellerin, Brandon Hill and Connor Trask are anxious to step up, Coach Pellerin said. Junior Braden Ballard, a 6-3 forward, also will see a bigger role with the Bulldogs. Few teams will be as committed to the guard-heavy, fast-paced style as Cony will be. Eager to bounce back after a 7-12 season and disappointing playoff loss to Gardiner, the undersized Rams are embracing an up-tempo and pressure-based scheme in an effort to overwhelm their bigger foes. It’ll continue on offense, where Cony will shoot early and often. The approach will call for big nights from junior point guard Jordan Roddy, who Maines called “one of the best players in the state,” as well as his backcourt mates in Nate Parlin and Taylor Heath. Nokomis went 6-12 last season, its first in Class A since 2009. The Warriors finished just shy of the playoffs last season, but with strong players returning, expect to contend for the postseason. Junior guards Josh Smestad and Zach Hartsgrove are three year starters in the backcourt. Last season had a steep learning curve for the tandem. “They have the ability to play through contact now. Both have gotten a lot tougher,” Nokomis coach Ryan Martin said. Senior forward Brad Allen began last season as the Warriors’ sixth man, before working his way into the starting five. A 25-point, 12-rebound effort in a late season game at Mt. Blue hinted at Allen’s continued development, Martin said. 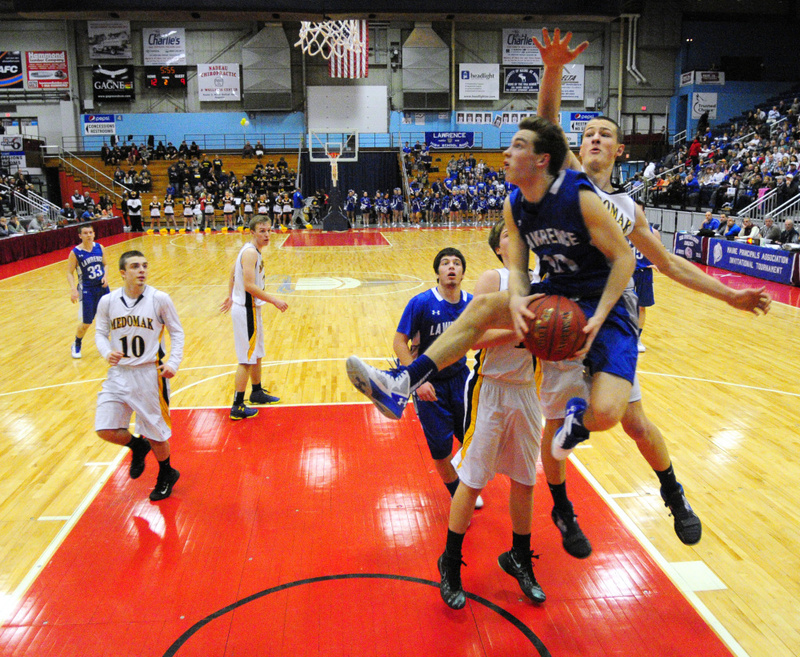 Like Nokomis, Waterville made a step up when the Maine Principals’ Association expanded to five basketball classes. Last season the Purple Panthers competed in Class A for the first time since 2005. Waterville used a couple of big wins to advance to the playoffs with a 5-13 regular season record and now third-year coach Nick Pelotte is looking for more improvement. “I can see that being in the third year with me, the familiarity is there. We’re getting to work on more advanced things. We’re giving the kids a better chance to succeed,” Pelotte said. Seniors Devin LeBrun and Alan Martin will look to build off the improvement made last season. With 12 players on a 17-man varsity roster 6-foot or taller, the Panthers could go big at times. Pelotte said this is the deepest team he’s had, and expects a strong sophomore class to fight for minutes. Erskine will look to keep improving after a 4-14 season that came after a winless one, with the goal of cracking the A North playoff field. The Eagles are young and short on experience, but have good starting points in senior forward and natural scorer Andrew Browne and junior center and shot challenger Noah Bonsant. Brian Kelly is the new varsity coach at Mt. Blue after previously coaching the junior varsity. Returning seniors Cooper Hollingsworth and Makao Thompson give the Cougars energy and experience, although the transfer of last year’s top player Zack Mittlestadt to Gould Academy leaves a scoring void.